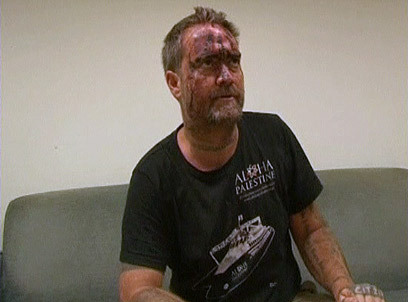 Israel has yet to decide on the format of an inquiry committee, but the moment one is formed, Kenneth O'Keefe, who was on board the Marmara ship and has been included in the IDF's list of terrorists who attacked commandoes trying to take it over, wants to return to Israel to give his version of events. In a special interview to Ynet, he said he is seriously considering returning to Israel to face the accusations against him. He added that he is certain all the evidence against him will be fabricated, and for this reason, it is important that he is present. The 41-year-old former US marine returned to Turkey with his face covered in bruises. He has been defined by the IDF as "a radical anti-Israeli Hamas activist, whose aim was to train and form a Hamas commando unit in the Gaza Strip." In his first response to the claims against him, O'Keefe said the allegations are "absolutely absurd". He noted that in the 18 years since his service in the US Marines, he has not been involved in a single act of violence. The former marine instead pointed the accusatory finger at the Israel Defense Forces. He said he has no interest in training anyone or spreading violence, and said this raises the questions, "How did they get to this? And When? A day after I left? Two days after? Maybe they even knew about it before I did?" He said he believes the accusations are an attempt to distract the world from the State of Israel's "terrible mistake". Meanwhile, he said he plans to return to his home in Europe, but would not specify where he resides, since "there will always be crazy people who will come after me." O'Keefe recounted his experience from the lethal flotilla. He said he was involved in disarming two of the Israeli soldiers, taking a handgun from one and a rifle from another. He said the Israeli violence came without warning, and noted that it was in international waters. The moment the first commanded landed, O'Keefe said, he saw a body between him and the soldier, and it was clear that lethal force was being used against the ship's passengers. He said when the second commando descended he could see three dead bodies, and added, "It was clear that it was either me or them". As soon as they descended, the former marine snatched their weapons and emptied their magazines. He said he did this to ensure there would be evidence in the event of a trial. According to O'Keefe, only the Israelis believe the government's story, and no one else is buying it. Of the battle with the Israeli commandoes, he said he was not afraid, but said he had flashbacks of his loved ones, and thought of the possibility that he may never hug his wife and children again. The former marine gave up his American citizenship nine years ago and married a Palestinian woman. He said inspiration for his part on the Marmara ship came from the Mahatma Gandhi's doctrine of nonviolent protest. He said he agrees with all of Gandhi's teachings, who he says believed that when one must choose between violence and cowardice, cowardice comes first, but in extreme cases, even Gandhi believed weapons and violence could be employed if the homeland and civilians' lives were threatened. O'Keefe added that when one is faced with the loss of honor, land or life, violence can be used for self-defense. He said the people on the ship were armed with metal rods and knifes, and said, "People are coming from the sky with weapons and killing your friends. What would you do?" He said that everyone on the deck was afraid, including the soldiers, who he said thought they would not survive. While he did not make it to Gaza, O'Keefe said he was pleased with the flotilla's outcome. He said the world's anger and pressure to loosen the siege on the Strip come as good news for Israelis as well, even if they are not aware of this. He said he is saddened by the fact that so many Israelis do not understand that the current policy regarding Gaza is wrong and destructive to Israel as well. He noted that there are 800,000 children in Gaza, and said there is no justification for subjecting them to terror and trauma. O'Keefe is also sympathetic towards captive solder Gilad Shalit, and said the situation is tragic for him and his family. He said he pity's Gilad's parents, and said he is also critical of Hamas and the movement's human rights, but said it is important to remember that the movement is in a tight spot. He said the fact remains that there are many more Palestinian families with children held in Israeli prisons, including people who were not involved in killings. He claimed that not all of the Palestinian prisoners receive visitation rights. He said allowing humanitarian visits to Gilad Shalit is impossible, since a Red Cross visit would reveal his location, and an Israeli operation may follow. He said it is important that Hamas conceal his location, and expressed hopes that all prisoners, including Gilad Shalit, are released in good health. O'Keefe said one of the world's problems is that the lives of individuals are valued over the lives of many. In a message to the Israelis, he said "I would like to see Muslims, Christians and Jews side by side." If Israelis want total control of the Holy Land, he said, they can achieve this now, but added this will not last forever, and is destined to fall just like the Apartheid regime. He said Israel must change its policies. On a final note, he said he loves all the world's peoples, including the Israelis, but said that until Israelis and their government put an end to the current situation, there will continue to be division. See all talkbacks "Flotilla passenger: Willing to face Israeli probe"